Aspergillosis is an infection, growth, or allergic response caused by the Aspergillus fungus. This fungus grows on dead leaves, stored grain, compost piles, or other decaying vegetation. TheAspergillus species includes more than 150 types of mold that occur widely in the indoor and outdoor environment. Aspergillus is commonly found as a lacy mold that grows on foods. "...cause serious illnesses in people or pets with a weakened immune system, underlying lung disease or asthma." Although most of the molds are harmless, a few can cause serious illnesses in people or pets with a weakened immune system, underlying lung disease or asthma. The most common species ofAspergillus to cause problems in dogs are Aspergillus fumigatus andAspergillus terreus. How did my dog get aspergillosis? Aspergillus is an "opportunistic pathogen", and usually afflicts animals that are immunosuppressed.Aspergillus fungi shed microscopic spores that float in the air and are easily inhaled. Fortunately, dogs have several protective mechanisms built into their bodies that help prevent infection. In the nose, these protective mechanisms include nasal sinuses to trap inhaled debris, the mucus layer that lines the nasal passages and traps debris, and the ability to sneeze and expel inhaled debris and foreign bodies. In the remainder of the respiratory tract, the mucus lining of the respiratory passages traps debris that enters the airways, and tiny hair-like cilia that are constantly in motion 'sweep' the mucus and trapped debris up and out of the airways. A healthy immune system provides active protection of the entire body, preventing invasion and fighting infections within the body. If Aspergillus spores, called conidia, are able to avoid these protective mechanisms and grow, they become more difficult for the body to remove. Some strains of the fungus are more pathogenic or dangerous than others, or a dog may simply be exposed to a large number of spores that overwhelm its defenses. Aspergillosis begins when susceptible dogs inhale mold spores. In some dogs, the spores trigger an allergic reaction. In others, the spores cause an infection. Most infections localize in the nose, while some dogs develop mild to serious lung infections. The most deadly form of aspergillosis – systemic or disseminated aspergillosis – occurs when the infection spreads beyond the lungs to other organs. Even when discovered and treated early, systemic aspergillosis is often fatal. What does it do to a dog and what are the clinical signs? There are two common types of Aspergillus infection in dogs, nasal and systemic aspergillosis. Nasal aspergillosis is the most commonly diagnosed form of aspergillosis in dogs. Most cases of nasal aspergillosis are invasive meaning that the fungus destroys the delicate bones of the sinuses. The less common and less invasive forms of nasal aspergillosis create an accumulation of mucous and fungus commonly referred to as a "fungal ball" or "aspergilloma." What the pet owner observes is a chronic nasal discharge ("snotty nose") that often has a strong odor, lasts for weeks to months, does not respond to antibiotics or other common therapies and typically involves only one nostril. Nosebleeds may occur intermittently and the edges of the nostrils are often rough, inflamed and ulcerated (the tissue ulcerates because of the discharge, which is very irritating). Many times the affected dog is of a breed with a long nose (collie, greyhound, dachshund, etc.) 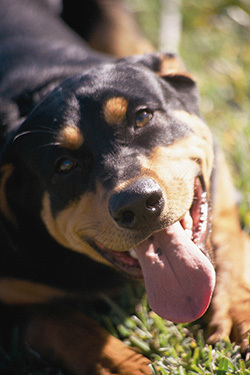 although one recent study revealed retrievers and Rottweilers to have the highest incidence of infection; it is possible that the affected dogs lived in an area with high levels of pathogenic Aspergillus. However, it is important to note that any dog can develop nasal aspergillosis. In systemic aspergillosis, the fungus enters the body through the respiratory tract and travels to other organs via the bloodstream, creating a more serious generalized or systemic fungal infection. 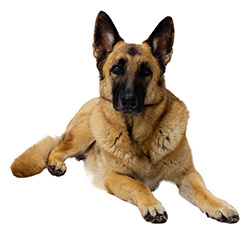 According to some studies, German shepherd dogs may be predisposed to systemic aspergillosis. "The clinical signs of systemic aspergillosis depend upon the location in which the fungus becomes established in the body." The clinical signs of systemic aspergillosis depend upon the location in which the fungus becomes established in the body. Common sites of infection include the bones and the intervertebral discs of the spine; clinical signs include lameness, weakness, and incoordination. Many dogs develop draining tracts (holes with pus or bloody discharge oozing out) in the areas of infection. Fever, weight loss, appetite loss, and uveitis (deep inflammation of the eye) are also commonly associated with systemic aspergillosis. Unfortunately, most dogs are terminally ill by the time they exhibit clinical signs. Radiographs or a CT scan (Computed Tomography is the method of choice) are consistent with a fungal infection. Fungal plaques or aspergillomas are visible with rhinoscopy (a technique where a narrow needlelike camera is inserted into the nose). Aspergillus organisms are seen in or cultured from either a tissue biopsy or nasal discharge. A blood test is positive for antibodies against an Aspergillus species. General anesthesia is necessary for diagnostic imaging (radiographs or CT scans) as well as for rhinoscopy. In many cases, the advanced equipment to perform these tests is only available at specialty referral practices or veterinary teaching hospitals. In some cases, the yellow Aspergillusplaques can be seen within the nasal passages without specialized diagnostic equipment. The diagnosis of systemic aspergillosis can be more challenging. Patterns of bone lysis (destruction) on radiographs or a CT scan may be suggestive of fungal infection. In some cases, the draining fluid or a tissue sample may contain visible Aspergillus organisms. If the organism is not visible, it may be cultured from a fluid or tissue sample. Ideally, there would be a blood test to detect pathogenic species of Aspergillus antibodies, allowing your veterinarian to make the diagnosis non-invasively. The current test to detect Aspergillus antibodies does not differentiate between species of the fungus; the presence of antibodies could be the result of exposure to the numerous non-pathogenic species of Aspergillus. Furthermore, dogs that develop systemic infections usually have a compromised immune system and may not be able to produce many antibodies. Fungal infections in general require extended treatment and many of the drugs traditionally used to treat aspergillosis have toxic side effects. Advances in techniques have enabled better success with the treatment of nasal aspergillosis, but systemic aspergillosis is still challenging to treat. 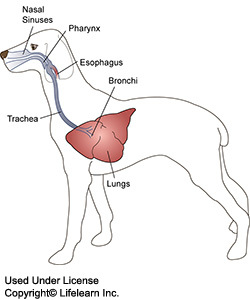 After anesthetizing the dog, an endotracheal tube (breathing tube) is placed in the trachea or windpipe, allowing the patient to breathe a mixture of anesthetic gases and oxygen. The area at the back of the throat is packed off with gauze sponges and an inflatable balloon catheter known as a Foley catheter. A 1% solution of clotrimazole, a topical antifungal lotion, is infused into the nose and frontal sinuses and the nostrils are sealed. The solution incubates for an hour, during which time the patient is periodically turned to ensure the solution contacts all of the surfaces of the sinuses. At the end of the incubation period, the clotrimazole is suctioned or drained out through the nostrils. "This treatment is highly effective..."
This treatment is highly effective with a reported 86% success rate, although approximately one-third of patients require several treatments. In most cases, the nasal discharge will have resolved within 2-4 weeks. If there is still evidence of continuing infection one month after the treatment, another treatment should be performed. If there is evidence that the infection has eroded through the bones of the nasal sinuses and has entered the brain, this treatment is contraindicated, and oral anti-fungal medication is required. Several months of therapy are needed and a 60% to 70% success rate has been reported. Treatment is particularly frustrating for systemic or disseminated aspergillosis in dogs. Amphotericin B is an older anti-fungal drug, largely replaced by newer anti-fungal drugs due to its high potential to cause kidney damage. Unfortunately, many of these newer drugs are less effective against aspergillosis. To reduce the damaging side effects to the kidneys, amphotericin B has been encapsulated in liposomes (microscopic fatty envelopes) or other lipid formulations; although they have been used in humans with some success, these formulations are extremely expensive. Long-term treatment (for months to years) with itraconazole has proven successful in some cases. Disseminated aspergillosis in humans has been treated with terbinafine and voriconazole, but there is very little research involving their use in pets. What is the prognosis for my dog? The prognosis is generally good for cases with localized nasal aspergillosis. The prognosis for systemic aspergillosis is guarded to poor, especially if there is evidence of sinus destruction. Can I get aspergillosis from my dog? "Birds are the most common source of infection in humans." 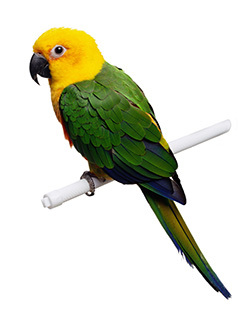 Birds are the most common source of infection in humans. While the potential to contract aspergillosis from your dog exists, it is less likely if you practice good personal hygiene, especially hand washing and avoid handling any discharges. If your dog has been diagnosed with aspergillosis, you should notify your physician for advice.